It can be hard enough finding ideas for a small bathroom sometimes, but when you have a budget as well it can feel nigh-on-impossible. Our experts here have searched high and low to bring you 10 affordable small bathroom ideas on a budget. Posted By Alan, 22nd Mar 2019. 9 Minute Read. Redecorating the home can be costly, so lots of us tend to put it off for as long as possible. The bathroom can therefore sometimes feel like the most neglected part of the home, so when you finally do come around to looking for ways to revamp it the chances are you’re probably working to a strict budget. If you’re bathroom isn’t very big then you’ll find that there are lots of limitations to ideas that you may like, but add a budget into the mix and you’ll quickly realise just why so many people struggle. Here at Victorian Plumbing we believe that there are tons of amazing, low-cost improvements you can make to small bathrooms, but you just have to know where to find them. This can sometimes be very time-consuming so we decided to use our bathroom expertise to put together a top 10 list of small bathroom ideas on a budget - to help give you a little inspiration to create the bathroom of your dreams. You may think having a small bathroom is just one big curse, but when it comes to bathrooms on a budget, a smaller bathroom typically needs less money spent on it. With that said, one of the best small bathroom ideas on a budget is combination bathroom furniture such as combination vanities. When you combine the toilet with a vanity unit and basin it’s like getting a ‘2 for the price of 1’ kind of deal which means you actually save money. The other benefit of having combination toilet and vanities is that you also save space; making this an excellent idea to consider. 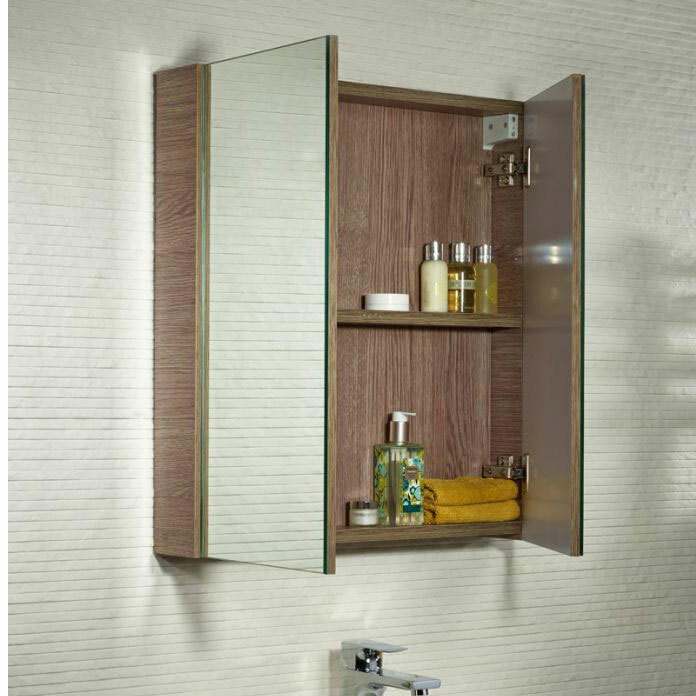 For those of you on a strict budget these cheap combination vanity units are a great place to start your search for ideas. It doesn’t matter which room we’re talking about, the corners in most rooms in the home are wasted. When space is a luxury it doesn’t really matter about wastage, but when you’re working with a small space such as a bathroom it can really make a huge difference. There is a huge range of bathroom fixtures which are designed to make the most of corners. One great idea is to think about adding an offset quadrant shower enclosure into the corner of your small bathroom. These offset enclosures are slightly larger than quadrant shower enclosures which means they offer a totally luxurious experience. If you prefer to have a bath then you might want to consider a corner bath instead. Can’t sacrifice one for the other? In that case, a corner shower bath is the best solution! Other great ways to make the most of corner space in a small bathroom are corner toilets! 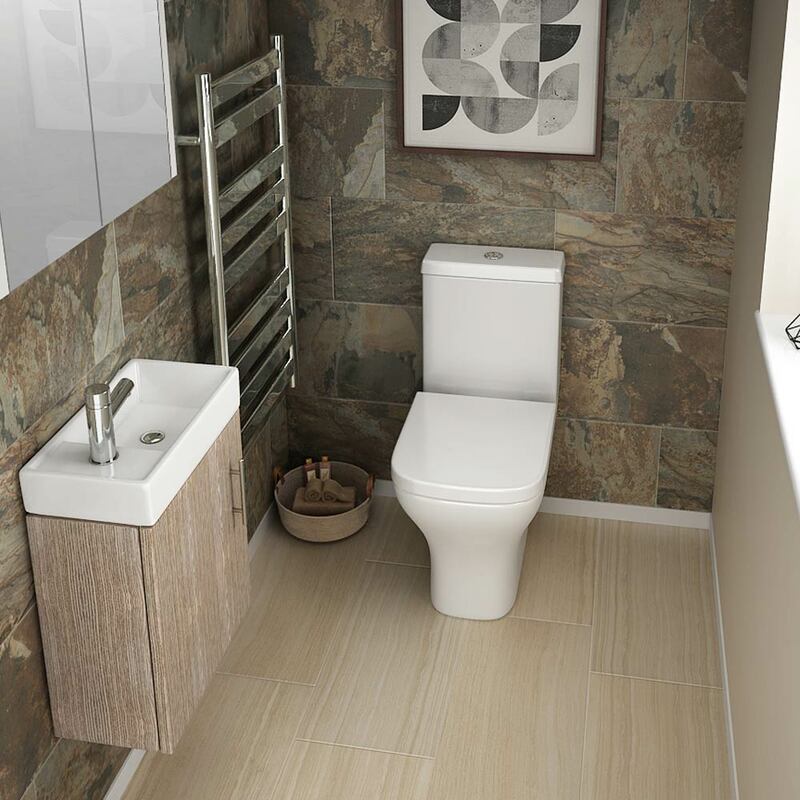 If you have to change the position of the original toilet by a substantial distance then it’s worth looking into the costs of this first as it may impact your budget, however if having a toilet in the corner is doable without a big cost then it’s well worth considering. In a small bathroom, it’s important to refrain from cluttering up the room. Wall mounted furniture and fixtures are not just a stylish idea, but they also utilise your walls rather than your floor; which creates the illusion of more space and also makes cleaning easier as you don’t need to battle with your hoover and mop for elbow room. There is a long list of wall hung fixtures for small bathrooms, although one of the most popular options is a wall hung vanity unit. You can find a wide range of cheap wall hung bathroom furniture and fixtures such as wall hung toilets and basins at discount prices. As with our first small bathroom idea, you can see in the image above that even wall hung basins and vanity units can be combined to save even more space and money. If you want to increase the perception of space in a bathroom it pays to have a lot of reflective surfaces. 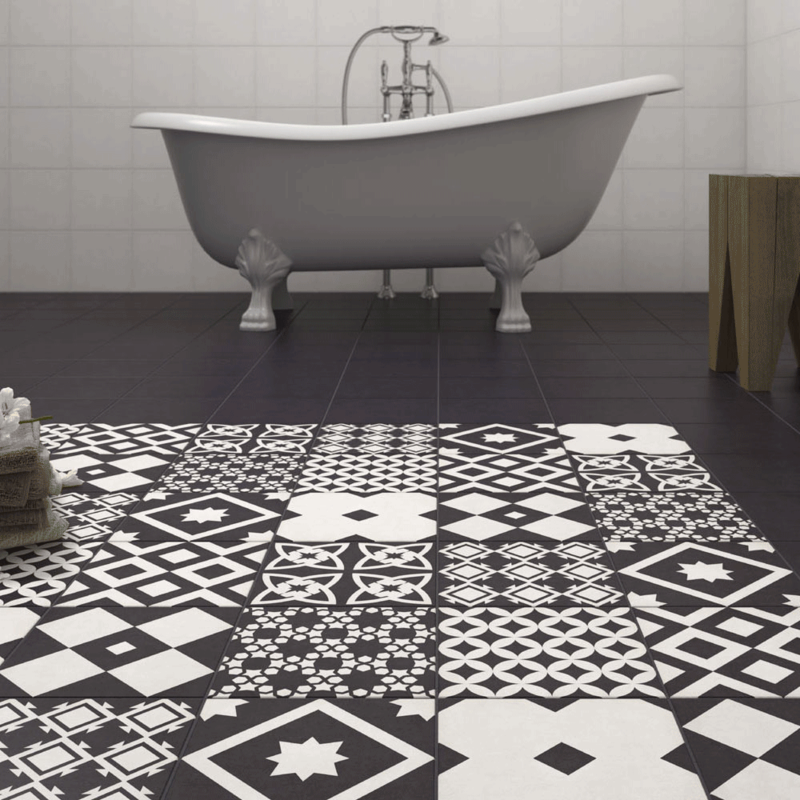 This makes ceramic tiles, especially those with a gloss finish, ideal adding style and reflectability. We covered this in a previous ‘tile ideas for small bathrooms’ blog if you’re looking for more inspiration for tiling. One trick to get a larger, more open feel in a small bathroom with tiles is to use a dark colour on the floor and then a light colour for the walls. A dark tiled floor creates a reference point for the eye and the contrasting light tile colours around it give the room a larger appearance. It’s purely trickery of the eye, but it works! Tiling a small bathroom on a budget can be a challenge, but with these cheap bathroom tiles available it is possible. If the cost of tiles is above your budget, but you already have tiles on your wall then consider painting them. Using light, solid colours you can add a totally refreshed feel to the bathroom without spending a lot of money by using tile paint. One of the cheapest small bathroom ideas is to add some lighting. The brighter your bathroom the larger it will appear to be. What’s more, there are lots of ways to increase the light in your bathroom without spending a fortune. You can find some very stylish bathroom lighting for any budget. A small bathroom doesn’t require huge lights and small simple lighting with a chrome finish (remember those reflective surfaces we spoke about) will have a huge impact. Look for LED lighting which is energy efficient and will help save money on your electricity bills! Adding a bathroom mirror with lights or two will further increase the light and reflectiveness of the room; creating a brighter and roomier-feeling space. 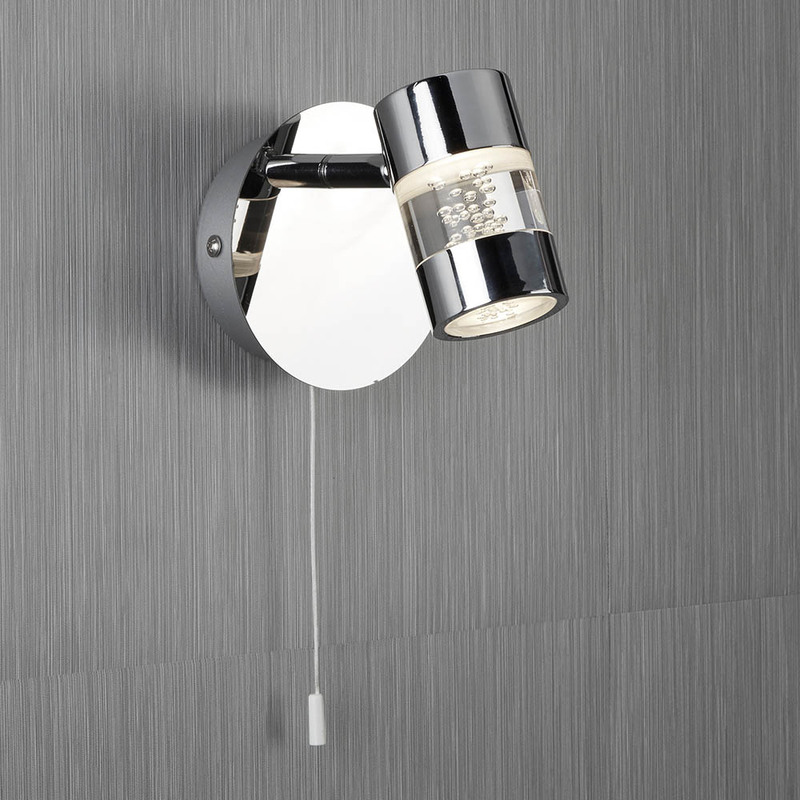 You can find a wide range of bathroom ceiling lights and bathroom wall lighting right here. When you’re looking to get the hottest deals in your bathroom it pays to go for energy saving items. Underfloor heating is a great option for those looking to save money on their heating bills and it’s hidden under the floor which means there’s less fixtures to add to the room thus giving you more space. Underfloor heating would be the ideal solution if you’re planning a new floor. As the name suggests it goes underneath the floor, so if you need to take up the current floor to install it then this may not be feasible on a lot of smaller budgets. If this is the case then simply opt for a radiator instead. 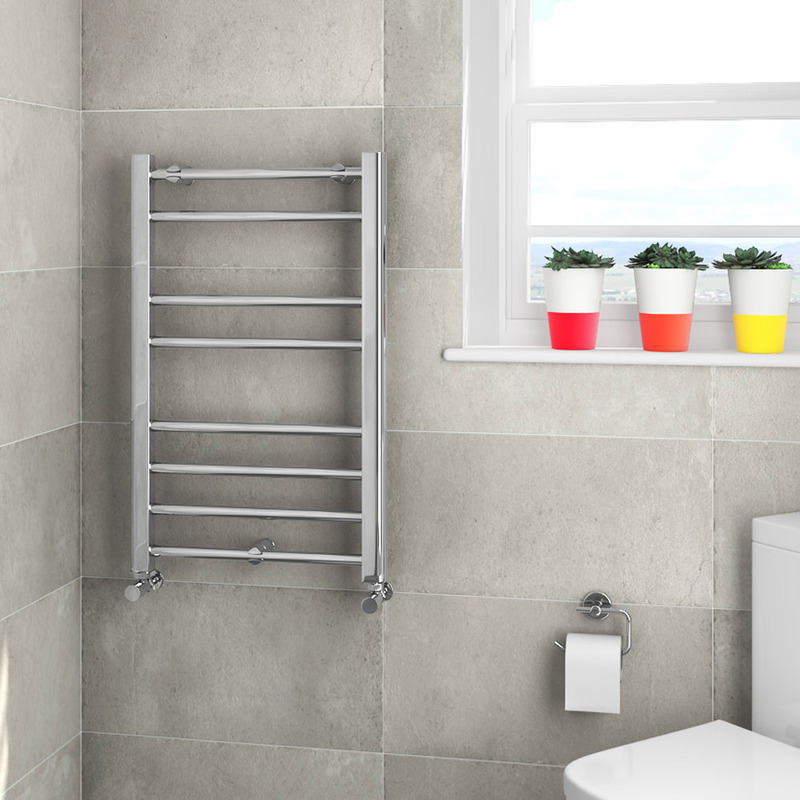 A small heated towel rail will certainly have no problem heating up a small bathroom and they add a stylish touch to the room. Choosing radiator with a chrome finish will help bounce light around the bathroom which will once again create the illusion of a bigger space. We recently wrote a simple guide to choosing the best radiators which you may find helpful, but for those of you who know exactly what you want these cheap radiators are just a click away. When there isn’t a lot of space in your bathroom it really pays to combine items where possible. We’ve seen it with combination vanity units and shower baths in some of the ideas above, but there is another affordable combination too! All bathrooms, whether it’s a large or small bathroom, feature at least one mirror. One thing you’ll really want to have in a smaller bathroom space though is storage space. One way of getting both of these things is to add a mirrored bathroom cabinet. They’re super-stylish and help keep bottles, tubes and whatever else you may have lying around hidden away in one tidy place. A mirror is great for making sure you look your best, but will also help reflect that all important light around the room to keep the bathroom feeling bigger than it is. Mirrored bathroom cabinets are also really cheap so they’re a great small bathroom idea when you’re on a budget! It may sound crazy to advise you to remove the bath from your small bathroom, but they actually take up a lot of space. If you’re anything like me you very rarely bathe and so your shower is all you really need. Try adding a frameless shower enclosure if you really want create more room. A frameless enclosure will reduce the obstruction of light which will help make the bathroom feel roomier. Opt for a compact 700mm x 700mm shower enclosure like the Apollo frameless shower enclosure pictured above if you’re bathroom is tiny, although removing a bath should give you ample space for a 800mm x 800mm shower enclosure. Sliding shower doors are also recommended in small bathrooms as a hinged door may restrict your movement. 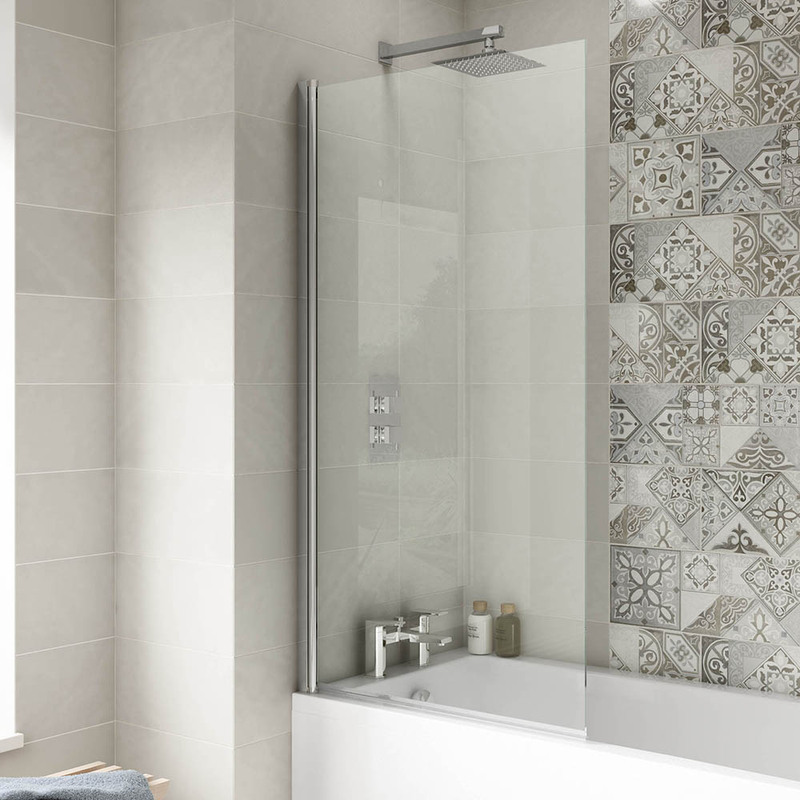 Many of us are put off by the though of a shower enclosure because they sound expensive, but you can actually find some really good deals on cheap shower enclosures if you know where to look. If the thought of removing a bath is just too painful then opting for a smaller bath could really increase space and save you money too! 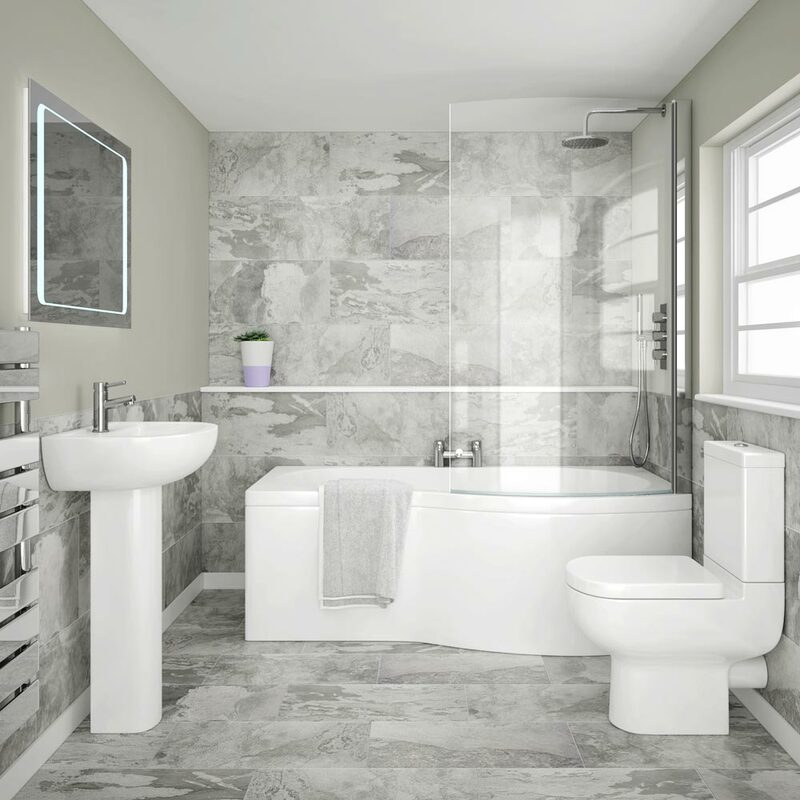 There’s a great choice of small baths with reduced widths and lengths that are really affordable. Also consider the idea of a bath with a storage panel which will allow you to squeeze a little more storage from tight spaces. When refreshing a small bathroom many of us tend to skim over toilets. With so many toilet options available, simply choosing a toilet without thinking about it is literally flushing you’re money away. 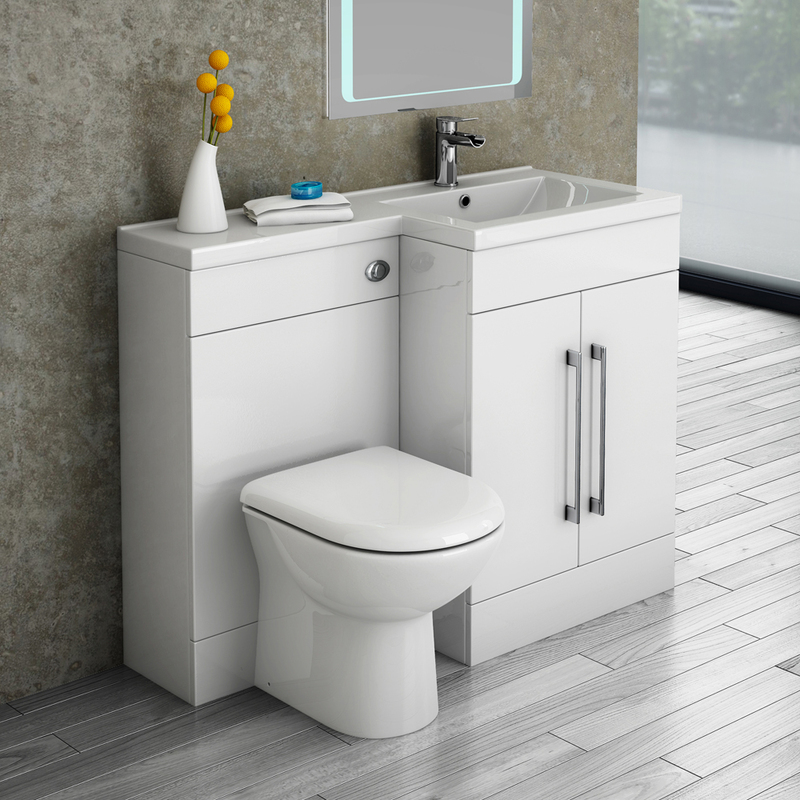 A short projection toilet has less depth than a standard toilet therefore it doesn’t take up as much space; making them a perfect idea for small bathrooms. We’ve also mentioned wall hung toilets and combination toilet and vanities earlier which are also excellent ways of saving space and money. When you’re looking for ideas to renovate a small bathroom on a budget, all of these toilets can be an inexpensive way to make a big impact. If you’re not already feeling positive about sprucing up your little bathroom space then here’s one more reason why the glass is not half empty for you. If you have a shower and a shower curtain then you may be making the room feel cluttered. Although shower curtains are usually quite cheap, some styles and designs can over power a small bathroom. A great idea is to have a bath glass screen instead of a curtain. The screen will allow the room to breathe and feel way more spacious. 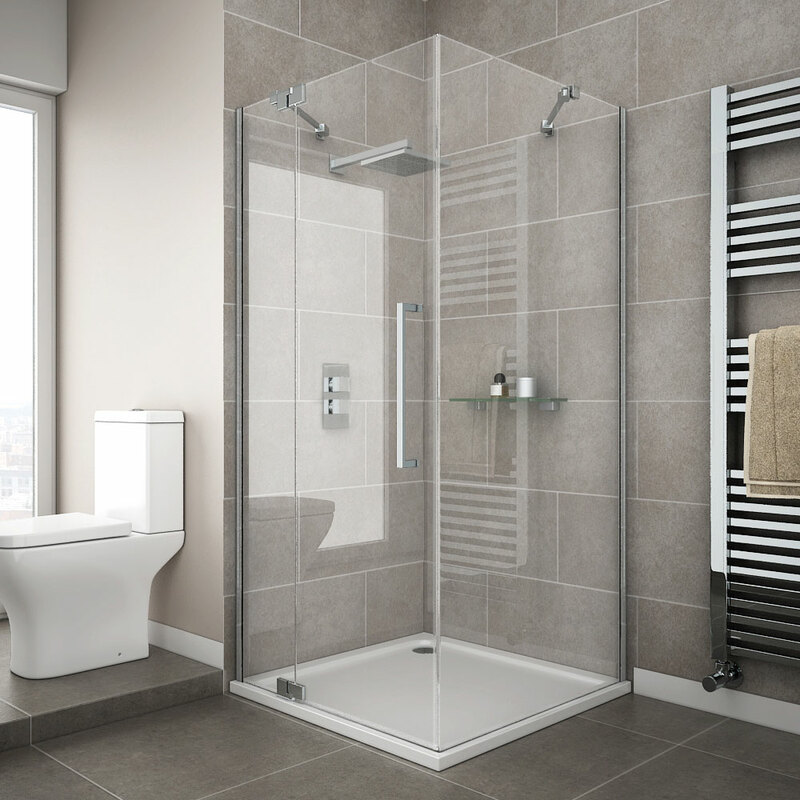 If you’re thinking of replacing a bath with a shower then a great idea could be a walk in shower. This small bathroom idea will really open your bathroom whilst providing highly practical and stylish feature which doesn’t have to cost the earth! We hope you have enjoyed finding inspiration in these 10 small bathroom ideas on a budget and feel free to share them with somebody who may also find them helpful. If your budget isn’t as small as your bathroom then you could also take a look at even more small bathroom ideas that we recently covered! Finally, If you’re looking to keep costs down on your next bathroom makeover then check out these cheap bathroom products! You’ll find lots of special offers, final reductions and sales on hundreds of bathrooms and products. Alan is one of our bathroom bloggers here at Victorian Plumbing. He likes writing helpful articles on bathroom trends and ideas. As well as writing his specialist buying guides, Alan can be found here sharing his expert 'how to' step-by-step DIY guides. When he isn't posting on the blog, he likes surfing the web for top bathroom tips and useful customer advice.